Sleep on your Purple Bed for 100 nights. If you don’t love your mattress, we’ll pick it up and refund your money. See, no pressure. To determine whether the original Purple is the right choice for you, read GoodBed's expert review of the original Purple mattress or watch our in-depth video review of the Purple mattress. 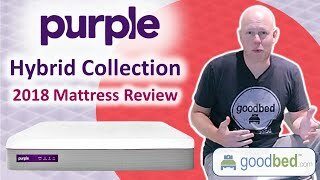 To decide whether the Purple 2, 3, or 4 are the right choice for you (including comparisons to the original Purple), read GoodBed's expert review of the Purple.4 mattress or watch our in-depth video review of the Purple.4 mattress. Is Purple the right bed for you? Based on 717 real owner experiences with this brand. How do people like you rate their Purple mattress? Mattresses are personal. Filter the 717 Purple ratings by sleep position, weight, age, gender and more to find the ones that are most relevant for you. Purple mattresses are recommended by 56% of owners on GoodBed (based on 717 ratings + 12 reviews). Want more reviews from Purple mattress owners? Do you have something to say about your Purple mattress? Write a Review! Comfort Layer Details: Scientifically engineered to intelligently flex under your pressure points (think shoulders and hips), while gently supporting the rest of your body. Support Layer Details: Individual responsive support coils aid the Smart Comfort Grid™ in dynamic pressure relief and support for the best sleep in the multiverse. Mattress Thickness: 9.50" to 13"
Note: The product line specifications above were derived from the active Purple models listed on GoodBed. As a result, these details may not be comprehensive and may not apply to all Purple models. If you are seeking specifications for a particular Purple mattress, please search for that mattress by name on GoodBed, or check with your local Purple dealer. Which mattress from Purple is best for you? Before shopping at Purple, take a short quiz to find which of their mattresses best matches your unique needs and preferences. Powered by GoodBed’s intelligent matching technology, you can even get your personal match score for each of Purple's available mattresses, in addition to other online options that match your criteria. Purple is a mattress manufacturer founded in 2015 that is based in Alpine, UT. Have an update or correction to our information about Purple? If so, please take a moment to suggest an edit. Purple mattresses sold by Purple come with a 100-night in-home trial. We’ll find a local donation center to come pick it up for you. Purple mattresses are only available online.